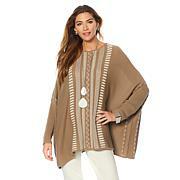 This is a wonderful substitute for a light weight sweater and can be worn in the spring, summer and fall. I love that there is actually a woven fabric on the forearm part of the sleeve and is chiffon everywhere else. It drapes beautifully over the body. Just received today and I love it!Very well made and different than any other cardigan I own.Ordered silver in a Medium.Usually wear a size 12. Exactly what I was looking for and Marla did NOT disappoint... Again, thank you for a fabulous sweater!!! 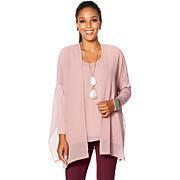 I love this sweater, it's loose and flows beautifully. It can be worn over and with anything, it can be that finishing piece. I purchased the gray and it is beautiful. lovely fit, color. Very soft lnitted fabric. Looks great on. Colors are beautiful for cool toned skin.